Beautiful teacup, saucer and yes, the sugar bowl is lovely. How wonderful you were served in such gorgeous china. Thank you for hosting and have a great week. Looks like you had a wonderful time! What a pretty and dainty setting. And you can't go wrong with orange pekoe and a scone & cream! Nice photos. I would have loved to have joined you! Have a great day, nice to meet you! I enjoyed my visit this evening. Your pictures are always so lovely, as are the tea cups that you share with us :) I love today's tea cup - it has a sweet beauty to. it. Fun party. Beautiful tea set at the tea house. The scones look delicious!! My hubby always drinks Orange pekoe whereas I like my range of different kinds. 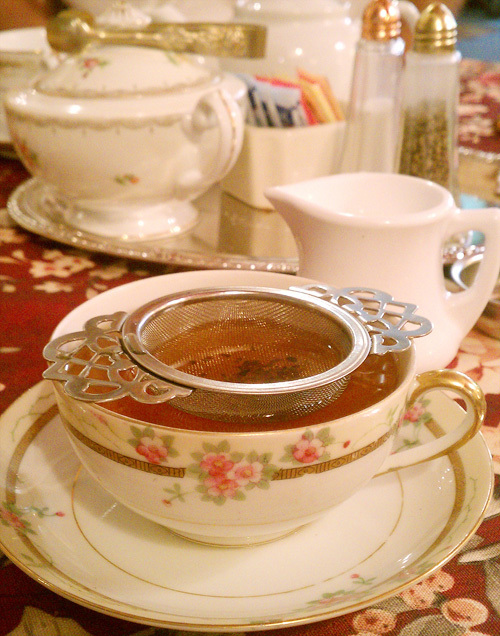 The teacup and tea things are really pretty and the scone looked good too. None of our tea rooms are open here on the Island this time of year. I only get to enjoy them in the summertime so I enjoy my own little teas at home with my hubby, friends, or just by myself. I look forward to it every day. Thanks for sharing your afternoon tea experience with us. 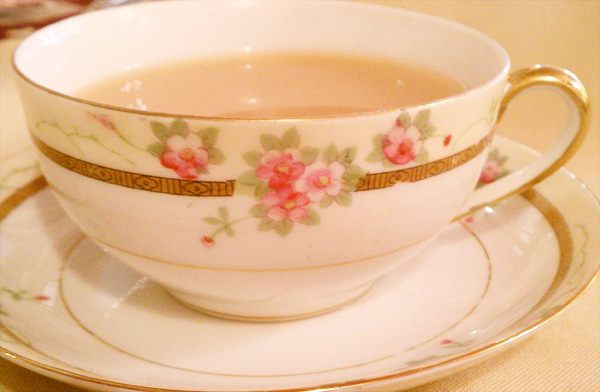 The rose pattern teacup & saucer is beautiful. Thanks for hosting. Wishing you a lovely week. I haven't done a tea post for a while but will soon. I do so love seeing all of yours though. Isn't it just so nice to be able to have tea in lovely old fashioned tea shops.To be able to dress up too. How lovely. You would feel like you were having tea at Downton Abbey :)pS I also love Noratake,and have a few pieces. It is so fine. GRACIAS POR VENIR A VISITARME A ARGENTINA OTRA VEZ QUERIDA AMIGA. ES UN HONOR PARA MÍ. ME PARECE PRECIOSO TODO LO QUE NOS HAS PRESENTADO, LA TACITA ES BELLA Y ELEGANTE Y TODA LA VAJILLA. TE DEJO UN BESO Y UN ABRAZO GRANDE, GRACIAS POR SER TAN GENEROSA Y LLEGARTE HASTA MI HUMILDE CASA. Hi Terri! Your tea is just beautiful and at such a lovely tea room. I like that tablecloth...it looks similar to the one in my post. Have a great week. Yes, I have always wondered how my tea shop would look like if I had one. Having a tea shop is a way to share the joy of drinking tea and talk about the beautiful cup, of course I mean and small family run tea shop. I am not really into the big chain tea shop. The photos look really nice. They have pink tone in them, I wonder if it has something to do with the table cloth? OH dear Terri, this must have been such a wonderful visit. A beautiful table, and eating that lovely cake ,drinking a tasty tea- having daydreams too. Terri if you ever made your own tea shop, it would be an amazing place, filled with the most beautiful settings,-and an adorable place ,for other to sit daydreaming! Terri I am going to have to have myself a tea today so I can link up with you and your beautiful Tea. I start with the end: Yes, I did it many times. I mean, creating a shop just in the head. It was one of my favoured imagination when I was young and very unhappy with my job. I always dreamed from a flower shop. My husband and I planned it when we walked in the evening through the city. I had many ideas and it made me lucky as if I already had this shop. This imagination came never true but I can still feel the luckiness when I remember those moments. So back to your wonderful tea time. How sweet to have a tea room with so nice china. The Noritake set is as lovely as the whole setting. And the scone looks delicious. I am sure if you once have a tea room it will be an extra delight for nice settings. And a lot of the decoration will be in aqua colors with gold. Everybody would be delighted to visit your tea room and one would need a long time to get a place. Thank you for sharing this delightful post and for hosting this sweet event. Oh my, what a pretty tea cup! I dreamed up and envisioned an entire Bed & Breakfast Inn...down to sheets and comforters for the beds and what to serve for breakfast and an afternoon tea! Just a dream, but just as much fun! Hi Terri! Horray - I posted teatime this week! Since school started in September I have precious little blogging time, but I didn't want to miss sharing my "moose" with everyone before winter had past! Now - your teashop looks like the one we used to have - it collapsed when the vintage historic theatre next to it imploded two years ago. A year later a retail tea shop opened but no sit down to tea shop since then. You complained about the red tablecloth - but I LOVED the look of it with your cups - so elegant and rich. The scone looks yummy, too. Must bake tomorrow . . . and read some blogs! I wish we had tea shops ( or even one) like that close to us. I can just picture you trying to get a look at the undersides of the dishes. It would be fun to have someone taking pictures of YOU as you check out the china! The Noritake teacup and dishes are so pretty. I like my Noritake china and have a few misc. teacups by them that are so pleasing to handle and sip tea from. Again, I thank you for hosting this tea-time event. I am so happy that I got my dose of prettiness and happiness here! What a lovely tea you had, and you paint a lovely story too, that is the best part! Hugs to you Terri, I am dreaming of being there. How lovely that you can 'dress up' - I've never heard of that before what a sweet idea. 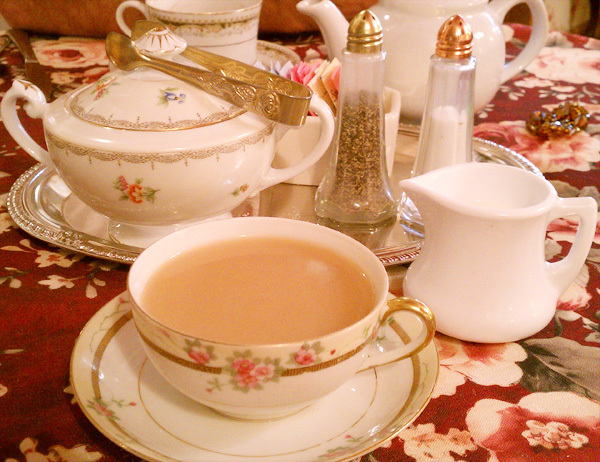 How wonderful to sit in a beautiful tearoom and sip tea. Your cup and saucer with the sweet roses is the perfect set for tea. 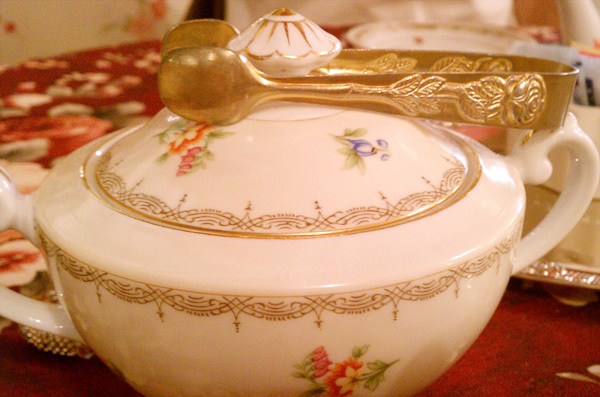 I love the sugar bowl with the tongs and it always tempts me to look for the mark. Thanks for sharing the scone and this is my favorite flavor of white chocolate. 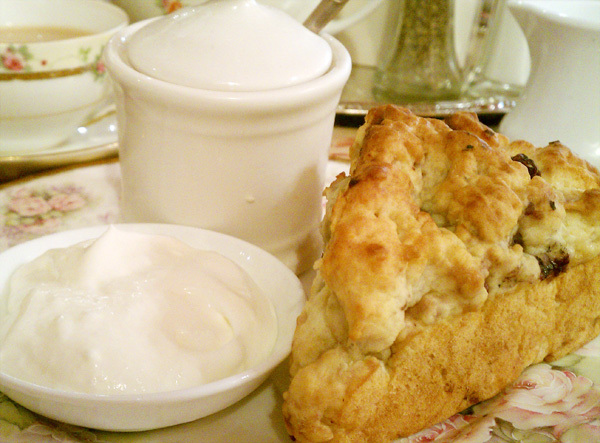 There is a white chocolate scone I have eaten at the Glenwood tearoom in Shreveport, La. They have a great cookbook but the owner had to write out the white chocolate recipe for it wasn't in their book. Your phone camera did a gret job...Or should I say you did a great job with it! It's an elegant setting....thanks for sharing it with us, made me feel like I was there with you. Sounds and looks like a wonderful way to spend some time relaxing. That cookie is yummy looking! The whole setting is lovely and it looks like you had a wonderful time! I'll be back with my teacup next week! Looks like you had a real treat out, with your afternoon tea. Tea, always tastes so much better in pretty teacups and how delicious the Devonshire cream and jam scones look. I am reading this early in the morning and haven't had any breakfast yet. So that picture of the pastry just had me groaning. Looks so good as do all your gorgeous photos. The dishes are so pretty and no you are not strange dreaming of your own shop someday. I do it all the time ... only a vintage shop. It's fun. Have a wonderful and warm weekend. I like your iphone pictures. It has a bit of vintage feel to them. The tea looks so pretty! I have a tea cup project I'm working on, so if I can get it done before your party closes, ill link it up! The pattern on this set is beautiful by the way. And why don't you stop by my linky party too (URL below), and link up some of your other favorite teacups? I just love seeing them! Talk to ya soon! Aren't tea shops wonderful? The teacup and saucer are beautiful--I love Devonshire cream and scones--we have a wonderful English pub nearby where we can get delicious Olallieberry scones and the Devonshire cream with our breakfast--such a treat! I think a phone would be much more inconspicuous than pulling a point and shoot out of your purse for photos - they turned out great. The scone sounds delicious and different versions are always nice to try. Dream about a tea room - all the time. интернет казино минимальными ставками или казино he [url=http://agnersabankgalen.narod.ru/file369.html]казино лотос лос анджелес картинки[/url] интернет казино при регистрации получаешь деньги qiwi com. форум гранд казино [url=http://agnersabankgalen.narod.ru/file225.html]интернет казино paypal qiwi[/url] интернет казино играть без регистрации и смс!